Finance Minister Arun Jaitley said the government did not want a merger of weak banks, and has hence suggested the idea of amalgamating one weak bank and two strong banks, in order to create an entity which is able to increase banking operations. The government Monday proposed amalgamation of three public sector banks — Bank of Baroda, Vijaya Bank and Dena Bank — to create what will be India’s third largest bank in terms of total business at Rs 14.82 lakh crore. This step will particularly help Dena Bank, the weakest of the three, which is currently under the Reserve Bank of India’s Prompt Corrective Action (PCA) framework and has been barred from extending fresh loans. The first major banking sector consolidation during the tenure of the NDA government was the merger of five associate banks of State Bank of India with itself. The government has also moved on Life Insurance Corporation of India’s proposal to acquire majority stake in IDBI Bank. Announcing Monday’s decision, Finance Minister Arun Jaitley said the government did not want a merger of weak banks and has, therefore, suggested the idea of amalgamating one weak bank and two strong banks, in order to create an entity which is able to increase banking operations. This also indicates the approach that the government may deploy in future consolidation. “Nobody should have a worry because this amalgamated entity will increase the banking operations. Its ability to increase and expand will be inevitable,” he said. 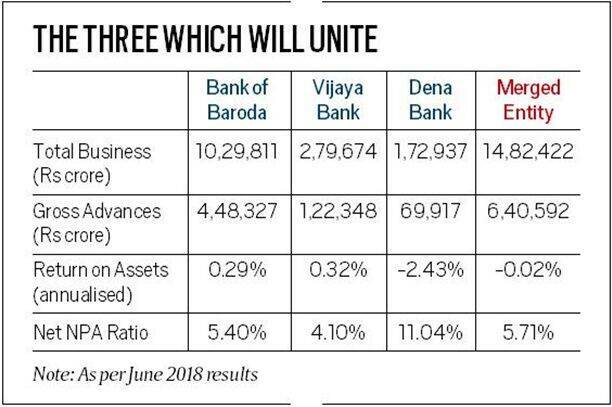 In contrast to net non performing assets (NPA) ratio of 11.04 per cent for Dena Bank, 5.40 per cent for Bank of Baroda and 4.10 per cent for Vijaya Bank, the combined entity will have net NPA ratio of 5.71 per cent, according to a presentation by Rajiv Kumar, Secretary, Department of Financial Services. Provision coverage ratio of the combined entity will be at 67.5 per cent, higher than the PSB average of 63.7 per cent, and it will have a total of 9,489 branches. The idea of amalgamation was proposed by a Cabinet-approved Alternative Mechanism on bank mergers comprising Jaitley, Railways Minister Piyush Goyal and Defence Minister Nirmala Sitharaman after a meeting Monday. The government had consultations with the Reserve Bank of India on the merger, Jaitley said. The respective bank boards will now consider and approve this proposal and prepare a scheme of amalgamation. The combined entity is expected to retain the regional strength of Dena Bank and Vijaya Bank. Jaitley said the bank boards will “shortly meet” and, after consultations, will consider the government’s proposal. While Bank of Baroda (BoB) will get access to the regional reach and business of the other two banks, Vijaya Bank and Dena Bank will benefit from the global network strength of the former, Bank of Baroda’s MD and CEO P S Jayakumar said, outlining the beneficial synergies that will arise out of the amalgamation. With State Bank of India earlier acquiring five of its associate banks and Life Insurance Corporation in the process of taking over IDBI Bank, the amalgamation of Dena Bank would still leave the government with nine more banks on a weak wicket. Apart from IDBI Bank and Dena Bank, the nine other banks currently under the RBI’s PCA framework are Bank of India, UCO Bank, Central Bank of India, Indian Overseas Bank, Oriental Bank of Commerce, Bank of Maharashtra, United Bank of India, Corporation Bank and Allahabad Bank. Banks are put under the PCA when they breach key regulatory requirements relating to capital adequacy ratio, return on assets and amount of NPAs. PCA banks are restricted from expanding number of branches, staff recruitment and from increasing the size of their loan book. Cost to income ratio of the amalgamated entity is estimated at 48.94 per cent, better than the PSB average of 53.92 per cent, while its Capital Adequacy Ratio at is estimated at 12.25 per cent, higher than regulatory requirement. Jaitley said that no employee on the combined entity will face any service conditions which are adverse in nature. The best of the service conditions will apply to all of them, he said. Jaitley blamed the UPA government for indiscriminate lending, which led to the massive rise in stressed assets in the banking sector. He said the present government has tried to cleanse the bad loan mess, with steps such as asset quality review of the banks, adequate provision against stressed assets and enactment of the Insolvency and Bankruptcy Code to address the logjam in the sector. In his presentation, Secretary Rajiv Kumar said the amount of NPAs have started declining even as recoveries have picked up pace by the state-owned banks.